It seems like it would be an odd question to ask retailers whose business is selling stuff but can loss prevention be free? I am certain that the majority of readers will be thinking that there would have to be a catch because nothing comes without a cost even if it is a hidden cost. I think of my sons going to college. Both were able to go “for free” taking into account the scholarships they were being given each semester. The money from the scholarships covered all of their necessary education expenses. It looks great on the surface but there is/was a catch. In the event their grades fell/fall below a certain grade point average they would lose those scholarships and they would be responsible for paying for their classes. That was a heavy weight for my older son to carry and one my younger son is still dealing with in his senior year of college. This is not a complaint, as we are extremely grateful that the scholarships have been available to enable them to attend school. It is only an acknowledgement that there is a certain price associated with the acceptance of the “free” scholarship. Loss Prevention Systems Inc. founder Bill Bregar knows that there is skepticism when anything is offered as free. His company, Loss Prevention Systems Inc. is focused on making stores profitable through shortage reduction and theft prevention. To do this he recommends stores install a Checkpoint System that will pay for itself. 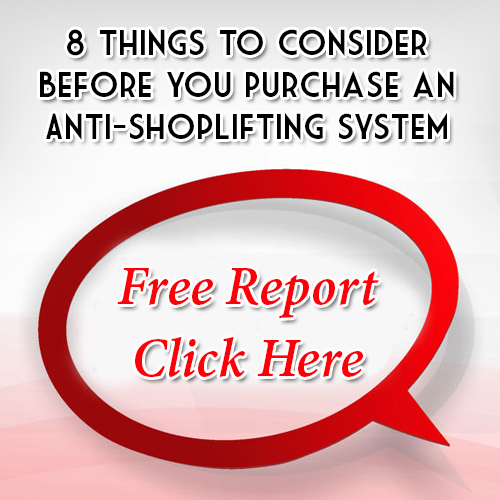 That’s right, an anti-theft system can reduce shortage and ultimately be free and by trying the Free Loss Prevention Calculator you can find out it is true. How free is this tool? Anyone can access the Loss prevention Systems Inc. website, click on the ROI Calculator and begin inputting numbers. There is no registration required, click on the link for the ROI Calc. at the top of the page and the form is right there. A manager or owner will enter the amount of their store’s annual sales and the amount he/she may want to spend on a Checkpoint security system. The Free Loss Prevention Calculator has a default estimated shrinkage calculation built into it of 1.2%. This is about the national average for retail shortage. The calculator assumes store shrinkage will be reduced to .65%, slightly less than a half of a percent reduction with the installation of a Checkpoint system. The actual results could be even better than this meaning greater cash savings. The number of months it would take for a system to pay for itself is calculated at the bottom of the page. Can loss prevention be free? The numbers are displayed right on your screen. After a system has paid for itself over the months figured in the calculation then ongoing savings are yours to reinvest, save or use to grow your business. How sure am I that an electronic article surveillance system works? I have worked extensively in Retail Loss Prevention as a Loss Prevention Officer and a Loss Prevention Manager. In those positions I used Checkpoint equipment and I have seen it work. I have also worked with electronic article surveillance tags and antennas in a college library and I have recovered a number of books and media materials from patrons who would otherwise have walked out with them. As the writer of the article I am sure some of you are still a bit skeptical of my claims so maybe I can ease your concerns after you read this information from retaildive.com, by Dan O’shea, March 6, 2017 in an article titled, “Dollar General tags Checkpoint for EAS deployment in 2800 stores”. According to Mr. O’Shea, ““Source tagging alone reduced theft of high-risk items by 44% in our stores” said an unnamed vice president of loss prevention at a major North American drugstore chain quoted by Checkpoint in the press release touting the Dollar General deal.”” The article mentioned that the Dollar General stores had experienced positive results in deterring theft through a trial of Checkpoint systems in a limited number of their stores. Surely the installation of EAS systems in 2800 stores is a testimony to the impact of a Checkpoint System in a store. You may not be the owner of 2800 stores but theft in those stores you do own can hurt more than theft in a national chain. You may not be able to afford 1.2% or greater shortage. That means you should be the one asking, Can loss prevention be free?” Use the Free Loss Prevention Calculator and see the answer for yourself. You will be pleasantly surprised. The Free Loss Prevention Calculator is important and we can help you with it. Call 1.866.914.2567 and let’s talk. Can Loss Prevention Be Free? -3 WC Blog 539Free Loss Prevention Calculator-3Take The Guess Work Out Of Shortage Reduction By Using The Free Loss Prevention Calculator It seems like it would be an odd question to ask retailers whose business is selling stuff but can loss prevention be free? I am certain that the majority of readers will be thinking that there would have to be a catch because nothing comes without a cost even if it is a hidden cost. I think of my sons going to college. Both were able to go “for free” taking into account the scholarships they were being given each semester. The money from the scholarships covered all of their necessary education expenses. It looks great on the surface but there is/was a catch. In the event their grades fell/fall below a certain grade point average they would lose those scholarships and they would be responsible for paying for their classes. That was a heavy weight for my older son to carry and one my younger son is still dealing with in his senior year of college. This is not a complaint, as we are extremely grateful that the scholarships have been available to enable them to attend school. It is only an acknowledgement that there is a certain price associated with the acceptance of the “free” scholarship. Loss Prevention Systems Inc. founder Bill Bregar knows that there is skepticism when anything is offered as free. His company, Loss Prevention Systems Inc. is focused on making stores profitable through shortage reduction and theft prevention. To do this he recommends stores install a Checkpoint System that will pay for itself. That’s right, an anti-theft system can reduce shortage and ultimately be free and by trying the Free Loss Prevention Calculator you can find out it is true. How free is this tool? Anyone can access the Loss prevention Systems Inc. website, click on the ROI Calculator and begin inputting numbers. There is no registration required, click on the link for the ROI Calc. at the top of the page and the form is right there. A manager or owner will enter the amount of their store’s annual sales and the amount he/she may want to spend on a Checkpoint security system. The Free Loss Prevention Calculator has a default estimated shrinkage calculation built into it of 1.2%. This is about the national average for retail shortage. The calculator assumes store shrinkage will be reduced to .65%, slightly less than a half of a percent reduction with the installation of a Checkpoint system. The actual results could be even better than this meaning greater cash savings. The number of months it would take for a system to pay for itself is calculated at the bottom of the page. Can loss prevention be free? The numbers are displayed right on your screen. After a system has paid for itself over the months figured in the calculation then ongoing savings are yours to reinvest, save or use to grow your business. How sure am I that an electronic article surveillance system works? I have worked extensively in Retail Loss Prevention as a Loss Prevention Officer and a Loss Prevention Manager. In those positions I used Checkpoint equipment and I have seen it work. I have also worked with electronic article surveillance tags and antennas in a college library and I have recovered a number of books and media materials from patrons who would otherwise have walked out with them. As the writer of the article I am sure some of you are still a bit skeptical of my claims so maybe I can ease your concerns after you read this information from retaildive.com, by Dan O’shea, March 6, 2017 in an article titled, “Dollar General tags Checkpoint for EAS deployment in 2800 stores”. According to Mr. O’Shea, ““Source tagging alone reduced theft of high-risk items by 44% in our stores” said an unnamed vice president of loss prevention at a major North American drugstore chain quoted by Checkpoint in the press release touting the Dollar General deal.”” The article mentioned that the Dollar General stores had experienced positive results in deterring theft through a trial of Checkpoint systems in a limited number of their stores. Surely the installation of EAS systems in 2800 stores is a testimony to the impact of a Checkpoint System in a store. You may not be the owner of 2800 stores but theft in those stores you do own can hurt more than theft in a national chain. You may not be able to afford 1.2% or greater shortage. That means you should be the one asking, Can loss prevention be free?” Use the Free Loss Prevention Calculator and see the answer for yourself. You will be pleasantly surprised.The Free Loss Prevention Calculator is important and we can help you with it. Call 1.866.914.2567 and let’s talk.